Soundsuits, Nick Cave: Epitome, 2014. A text by guest blogger Melissa Gitari. In her thought-provoking text Afrofuturism: The World of Black Sci-fi and Fantasy Culture, Ytasha Womack defines Afrofuturist art as a ‘way of imagining possible futures through a black cultural lens’. The ‘act of projecting black culture into the future’, as Womack puts it, is a direct affront to the systemic attempts to erase and repress the black community on a global and historical scale. As a long-time fan of Afrofuturist musicians like Solange Knowles, Missy Elliott and OutKast, I wanted to use my time at the Stuart Hall Library to enhance my understanding of this theoretical framework. I am especially interested in the ways that black artists reimagine the black body through avant-garde aestheticism, and in doing so, transport the black body away from spaces where it is endangered. Nick Cave’s Soundsuits embody Womack’s idea that, in Afrofuturist art, ‘the imagination is a tool of resistance’, a way of eschewing the limiting bounds of identity forced on marginalised people and establishing alternative modes of self-expression. 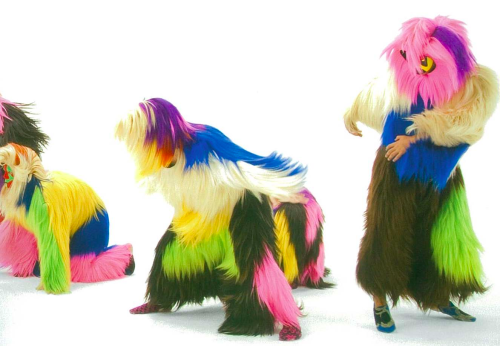 The Soundsuits are a series of mixed media sculptures that are worn by models who dance in them during exhibitions. Cave uses found objects like old toys, hair extensions and pipe cleaners, juxtaposing seemingly disparate materials to construct his jubilant bricolages. I was drawn to Cave’s work after seeing a video on YouTube of the Soundsuits in action. I decided to delve deeper into his work at the Stuart Hall Library, and managed to find a book called Nick Cave: Epitome by Andrew Bolton, Elvira Dyangani Ose and Nato Thompson (2014). The book features a selection of in-depth interviews with Cave himself as well as several hundred photos of the Soundsuits in motion. What captivated me the most about Cave’s work was how the suits do not just transform the wearer, but they also redefine the space the wearer exists in. They are a bold assertion of the wearer’s existence and their right to take up space. Once in the suit, the physical markers that define a person, their race, gender, age, become inscrutable. 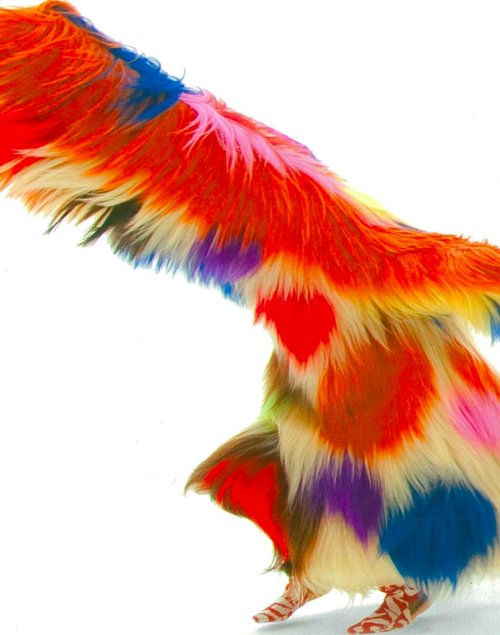 All that remains is the visual and aural performance of the suit, which becomes a language in itself, a way of communicating identity through sound, colour and texture. The wearer’s obscurity allows them to transcend categorisation and stereotyping – to simply exist. While Cave’s Soundsuits are vibrant and jovial in appearance, their origins are surprisingly sombre. In Nick Cave: Epitome, Cave describes walking through a park one day in 1992, his heart heavy with the news that the four police officers who assaulted black civilian Rodney King had been acquitted, when his attention was caught by a single twig on the ground. He was struck by the meagre, discarded thing, seeing in it the vulnerability of black people in America, whose lives are treated with a similar disregard. Cave decided to collect some of these twigs to channel his sorrow into something creative. He fashioned a suit out of them which he described at the time as being a form of armour, something in which he could be safe. In a world where the black body is treated as if it were disposable, Nick Cave’s Soundsuits reflect a desire to protect that body from acts of systemic violence. To be black in America, according to Solange, is like being on a never-ending ‘mission’ for liberation, and in order to survive, sometimes you must ‘take a break’ from it all. The black home, then, becomes a safe haven, a planet far, far away where the black body can exist without fear of persecution. In terms of visuals, a lot of the outfits Solange wears in her music videos take on an armour-like quality, not unlike Nick Cave’s Soundsuits. In the video for ‘Don’t Touch My Hair’, we see Solange in an orange, sleeping-bag-like ensemble, which echoes the sentiment expressed in ‘Borderline’ that black people should withdraw from the world into a home of their own. This outfit bears a resemblance to Missy Elliott’s famous trash bag ensemble in the video for her hit single ‘The Rain’ (1997), suggesting that Afrofuturist artists do not create in a vacuum but are in dialogue with each other. Similarly, in ‘Cranes in the Sky’, the singer sports a large, ruched coat in baby pink which seems to almost swallow her whole. Given the song’s subject matter, which is the pervasive feelings of unease and malaise that come with being both black and female in America, this coat can be interpreted as a form of padding to protect one from the constant physical and emotional blows to her person. Contrastingly, later in the video we see a naked Solange covered in gold paint sitting on a craggy plain, a utopian image that envisions a future where the black body can finally exist, unclothed, vulnerable and without fear. It has been thoroughly enriching reading about Afrofuturism, and learning that it can encompass anything from the stories of Octavia Butler to Missy Elliott sporting a large trash bag. The comprehensive nature of this term reflects the creative intentions of artists who follow its tenets; to expand and reshape notions of blackness, and to give black people autonomy over their self-definition. In a world where identity is constructed in terms of rigid binaries, Afrofuturism lets the black diaspora know that they have the power to create themselves. Melissa Gitari is an English Language and Literature graduate living in London. Her interests include postcolonial fiction, writing poetry and hip-hop music. She hopes to pursue a career in book publishing.